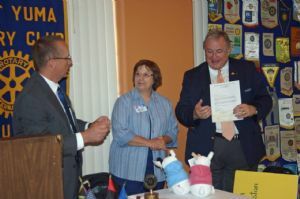 The check is earmarked for something dear to District Governor Tilton's heart which is the "Adopt a Village" program. This money will go to an extremely impoverished village in Niger. Please go to http://www.rotaryd5500.org/adopt-a-village.pdf to read all about this special village. It will make you appreciate where you live and what you have and hopefully open your hearts to those less fortunate.